My life has been filled with ups and downs from being a Dallas Cowboy cheerleader for four seasons to battling an eating disorder that nearly took my life in 2000 and successfully overcoming it. But I never knew that my first act would begin on Oct. 1, 2011 for both the good and the bad. I had gone in for my six-month mammogram. I had being given a 40th birthday present from mom of being tested to see if I carried the BRCA gene after knowing that my grandmother, my mom and her twin sister, two cousins and two other relatives had breast or ovarian cancer. I did carry the BRCA ER positive 2 gene. The doctor called me and told me I needed to come in right away; I knew I had breast cancer. They first thought it was dci 1, but it wasn’t and it turned out that when I had a double mastectomy they found out I had stage 3c invasive ductal carcinoma. My fight was long, and I knew this would forever change my life. Through three different rounds of chemo all 16 weeks and over 96 rounds of radiation, I never gave up. From having my port become infected and being replaced three times to finding more cancer and undergoing more surgery after surgery, I knew I had to fight like a girl!! I had watched my mom, Marla Sue Mason, battle stage 4 metastatic breast cancer for over 18 years; it came back four times, but she never gave up. She volunteered at the center where she was receiving treatment and would tell everyone, “I don’t have a terminal illness ,I have a chronic illness that can be managed with treatment. And faith.” She lost her battle Feb. 24, 2014. In September 2014 my life would begin its second act. My doctors informed me that my cancer had metastasized to my bones and I was told I would live two to four years, maybe. Yes, I had my “why me?” pity party that night, but at 2 a.m. I woke up and had two visions. 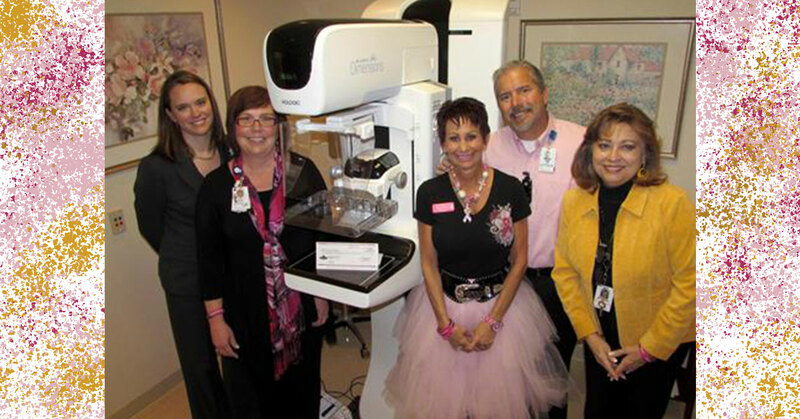 I had heard about three weeks earlier about a new type of mammogram 3d digital tomography and it was reducing calls back by 40 percent and catching breast cancer up to 18 months earlier than a normal 2d mammogram. I also learned it cost a woman without insurance $111 to have this latest mammogram. I started writing down cost time this, times that and REBA’S VISION WAS BORN. I thought if we could raise $3,000, we could maybe save 25 women from what I and so many others have gone through. I also want to help women currently in treatment feel beautiful by providing them with a Basket of Hope, which comes from their surrounding community filled with books, hats, makeup, jewelry, anything that might give them hope. I had been given such items while I was undergoing my treatment. With the help of Gina, my friend Eileen Joy, we were able to turn my place of work — at the time Texas Roadhouse Peoria—into Roadhouse Pink. The community got behind us and helped us that month raise over $29,000. Little did I know that four years later were at nearly $200,000 with donations from strangers to such corporations as Walmart and our never-ending fundraising events. I am so excited that 100 women so far have used the Pink Roadhouse Mammo Fund, and over 75 Hope Baskets have been handed out. During our fundraising events I have had the pleasure of meeting so many women living their second act. They are loving life, and it brings a smile to my face listening to them talking about their journey and hearing about how breast cancer changed their life for the good by giving them their second act. My second act continues now by providing free wigs, bra, prosthetics, hats and scarves, anything a woman needs while in treatment for any form of cancer at no cost to them through generous donations from women who have been there and survived. To see the smile on the faces of women trying on a wig and feeling human once again to helping a young mother with children smile when she receives her basket filled with items from you and others who understand, then seeing her smile through the tears of pain, I know she will be stronger and will beat cancer. My second act is still going strong from the amazing support of my husband Steve, who I met while battling cancer and married two years ago, to my family to countless friends, business owners and especially one woman, my amazing angel, my mom. I’m ready to begin my third act now not letting a little thing called cancer beat me.